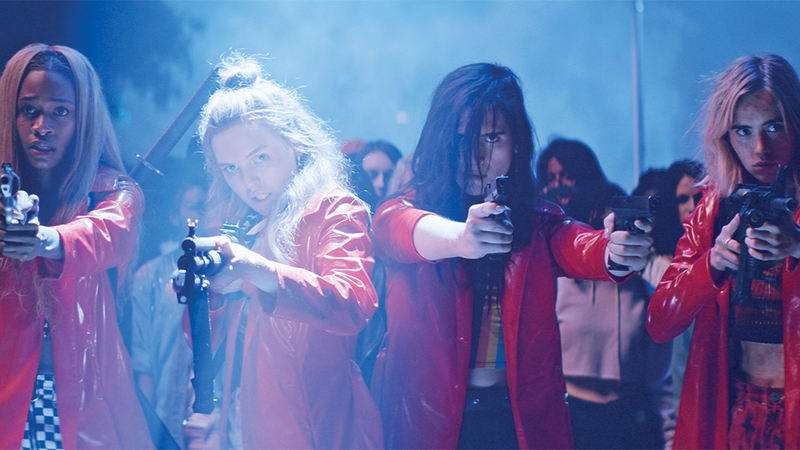 Assassination Nation follows four female high school best friends in Salem. When a hacker releases personal web and phone data of Salem’s citizens, the girls have to protect themselves at all costs. Writer-Director Sam Levinson creates a Film unlike any made before it. He follows his lead characters, four females, and depicts the violence and misogyny they face in their daily life. But he doesn’t make his characters passive and weak. Instead, they are active and powerful. Able to fend for themselves. Its action-packed from beginning to end with humour, violence, and blood … lots of blood. What very refreshing is that Levinson writes his heroes with flaws and questionable decisions. All which add to the believability of his characters in this satirical yet all-too-real world. And Levinson has found a perfect Ensemble of dominant women consisting of Odessa Young, Suki Waterhouse, Hari Nef and Abra. Assassination Nation screens at Sundance on Jan. 21 at 11:59PM at PC Library, Jan. 22 at 12:15PM at Ray PC, Jan. 24 at 11:30PM at Prospector PC, Jan. 25 at 12:30PM at Ray PC, Jan. 25 at 11:59PM at Tower SLC, and Jan. 27 at 11:59PM at Tower SLC.